« Matthew Shortt: 4 games and 4 defeats with Arsenal, but then a success in America. James A. Quayle was born in Charlton in 1890 and played left back with Fossdene Old Boys, Old Charlton and Woolwich Polytechnic. He joined Woolwich Arsenal as an amateur player on 24 August 1907, and although he re-signed for another year on 2 June 1908, he then received an offer from Northfleet, and so moved onto there, playing for two seasons before turning professional and rejoining Woolwich Arsenal on 19 October 1910. He made just one appearance for the club, as a deputy for Joe Shaw against The Wednesday on 12 November 1910. In the match, which Arsenal won 1-0 he was badly injured and had to leave the field of play. He did not play football again. Also I have been unable to find any further record concerning his life after being forced out of the game. Here is the list of all the players from this season that we have covered so far. 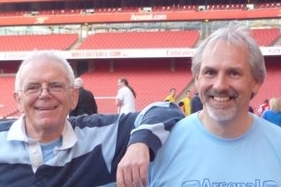 Hello, I am the grand daughter of James Quayle — and his great grandson, Timothy Quayle Eng, will be at the Arsenal vs Sporting match on October 25! Please contact me if you would like more information on him.